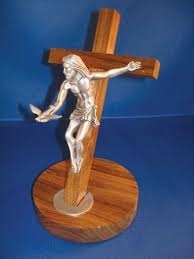 Walnut Gift of the Spirit Crucifix 8"
The Crucifix is the greatest sign of Christianity. This Crucifix, with the loving Christ bending toward the troubled world extending His offer of the Gift of Peace, symbolized by the spread winged dove, expresses perfectly the gospel message of Jesus, "Peace I leave with you. My Peace I give you."